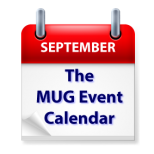 The MUG Event Calendar for this week features some great video production information at a California creative pro group, an augmented reality program at an Ohio group, and a review of Apple’s new hardware at a Virginia group. Los Angeles Creative Pro Users Group – Back to School Night. We welcome back USC Professor and editor Norman Hollyn who will take us on a tour of the soon to be released movie, SHOT from Director/Profesor Jeremy Kagan. Norman was editor and worked with Kagan on a story and style choice. The script called for most of the movie to be done with split screen. Also we welcome for the first time editor/teacher Sven Pape, AKA "This Guy Edits." Sven has close to 81,000 subscribers to his wildly popular YouTube channel. Sven will talk on the creative and business side of editing. Also, filmmaker Michael Wohl returns for a discussion of the process for creating 360° video, from prep, to shooting, to post, with an emphasis on the common traps and mistakes that people familiar with traditional production often stumble on.